Most detailed visit of Venice in company of the local guide. Venice in Depth tour is a combination of Essential Venice and Venice in Depth tour allowing for the most complete visit of the city. 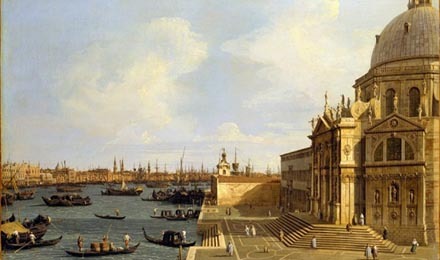 Your private lecture-tour begins at the Byzantine jewel of Venice , St. Marks Church and Square. From here you experience architectural splendor of the Bell Tower - Il Campanile, Renaissance Masterpieces and a breath-taking view of the old harbor (Bacino di San Marco) from the Ponte dei Sospiri - " Bridge of Sights ". A stop at Marco Polo's House precedes you visit to the Rialto Bridge , a perfect finale to your first part of the tour tour. After a stop for a snack or cappucino you walk the real Venice and watch locals as they go about their daily routines. Works of Titian and Tinteretto highlight the art discoveries. Views from the Grand Canal burn through your heart (and a few rolls of film). Churches, pallazzos, piazzas and a few Casanova haunts dot your journey as well. Essential stops include the Accademia Painting Gallery and Bridge, San Margerita Square, Frari Church, and Ca' Rezzonico (A Venetian House depicting 18th century life). After listening to your Lecture-Guide, you understand why Venice was once considered La Serenissima Dominante (The Most Splendid Maritime Republic). The information and inspirations only increases your appetite for Venetian sights, sounds and secrets. BOOKING FOR A BIGGER GROUP ?